When a tech startup announces a new product, sometimes there is a collective yawn and perhaps a “wonder how long this will last for?” mentality. After all, never a day passes without at least some “cool” new app being invented that promises to change the world. Look at Product Hunt. The evidence is right there. Most of these startups start with a boom but then fade away with a whimper. But sometimes there are exceptions and Slack is one of them. Slack has entered the Big Boys Club where its name has also become a verb. Just like “let me Google that for you” or “I’ll Skype you later for a chat” Slack has also become synonymous with chatting online (“let me Slack you”). Some people are beginning to have Slack divorces now, but the vast majority still love it and use it. Slack is, at its core, a chatroom, with the ability to set up an unlimited number of more new chatrooms. When you sign up for Slack, you get your own workspace, and in that workspace, you set up chatrooms (called “channels”). These channels can be public or they can be private. If they are private, the only way in is for the owner of the room to invite you in. Also, you can have private “direct messages” with the various registered members of the Slack workspace. 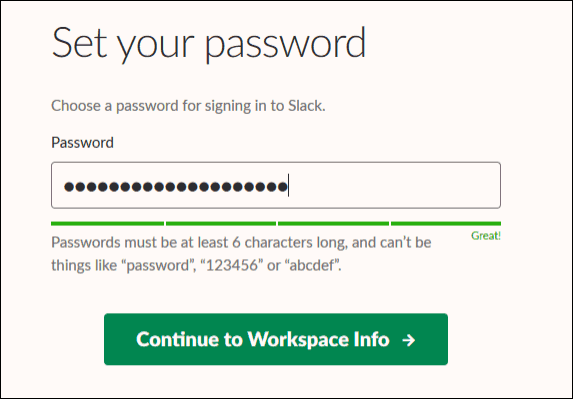 To get into a workspace, you have to be directly invited by the owner of the workspace and you set up your own Slack account before being permitted to log in for the first time. This makes Slack ideal for remote international online teams. Instead of a physical office, Slack serves as an online office that never closes. Isn’t Slack Just a Fad? If you are not familiar with Slack, then you would be forgiven for thinking this is just yet another app that will soon wither and die. But far from it. Look who has endorsed and is actively using Slack in their corporate office environments. That’s obviously not an exclusive list. But if Slack is good enough for the State Department and the New York Times, then that tells you something about its potential longevity. In fact at the New York Times, staffers are setting up private Slack channels to vent about their bosses and new controversial workplace changes. So What are the Downsides to Slack? Like anything in life, Slack has its downsides as well. In fact, I linked to an article above in which someone wrote he was “splitting up with Slack.” His reasoning actually resonated a bit with me. And therein lies the problem. You are expected to reply instantly. With email, you can reply when you want to. When a Slack message pings on your screen, the person is more or less sitting there waiting for a response. Plus, this tweet sums it all up. But you know, I thought a lot about this before writing this article, and I came to this conclusion: Slack will only control your life if you let it. Just like email, you have to set boundaries. Make a Slack policy and let everyone know about it. Tell them you will reply to their messages when you are able to and not before. That you have a life and are not compelled to reply within 30 seconds. If you show Slack and its users who the boss is, then I don’t see why you can’t use it to your advantage. Despite my initial reservations about it, I have actually grown to like Slack. And people who know me well will tell you I’m as sociable as a bear that hasn’t eaten in months. Let’s set up a new Slack channel on the free plan, and you’ll see how easy it is to get set up. When you click the Get Started button on the main page, you will get two options. 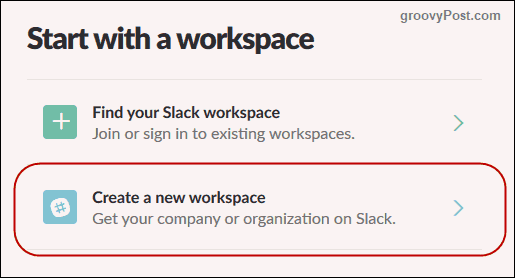 I’m assuming you want to make your own Slack workspace so let’s click on the second option. You will be then asked for your email address. Once you have put in your email and clicked Confirm, you will be sent a PIN code to your email. Type in the PIN code to prove the email address is yours. 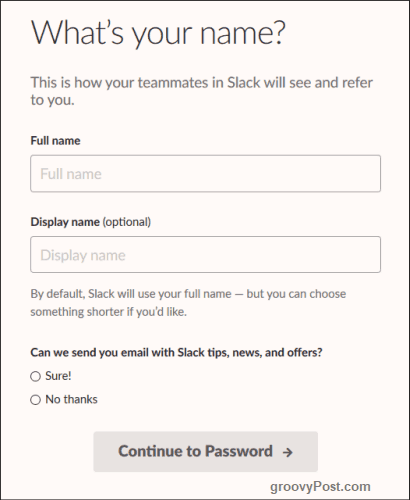 Now you will be asked for your full name, the name you want to be known by on Slack, and if Slack can send you email. You can say yes to the last one. In all the years I have been using Slack, it has very rarely sent me email. They won’t spam you. Now the password. Make sure the strength generator goes green all the way to “Great!“. Then click Continue to Workspace Info. Now you will be asked about your company. Fill in each one with the relevant information. We come now to the most important part – what name you want to give your Slack workspace. For professional companies, it’s a no-brainer. It will be the name of the company. However, if you have a common name, you may find that some impertinent soul has swooped in and grabbed the name you want. In that case, you will have to get creative. When you’ve got the name you want, click Create Workspace – and you’re done! You can change the name of your workspace at any time in the future, but you should really try and avoid that. Not only are you trying to build a brand, but changing the name in the future is just going to confuse your employees and clients. Now log in to see your new Slack workspace. I recommend using the free desktop software, and there are free apps for the smartphone and tablets. 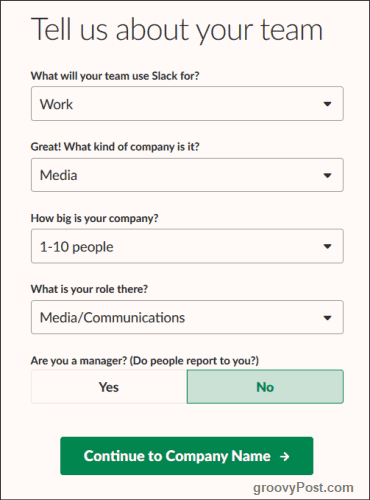 Before logging in, you will be asked if you want to invite anyone to join your Slack workspace. This totally depends on what you plan to use Slack for. If for your company online office, then you will want to invite your colleagues. If on the other hand, you want to use it as your own private workspace, you will want to refuse all invitations. If you choose to upgrade to a paid plan, you get more features such as unlimited searching, group voice and video calls, screen sharing, unlimited use of apps, and best of all, guest access to people such as freelance business clients and contractors. I am seriously considering upgrading since it has just told me it is willing to give me the first 6 months free. It’s now time to customize your Slack channel. 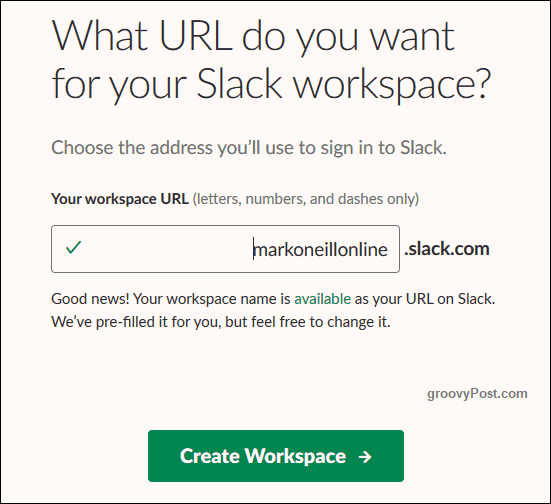 You can get to the customizations page by going to https://NAMEOFSLACKWORKSPACE.slack.com/customize . This is not one for me as I kind of detest a lot of emoji. 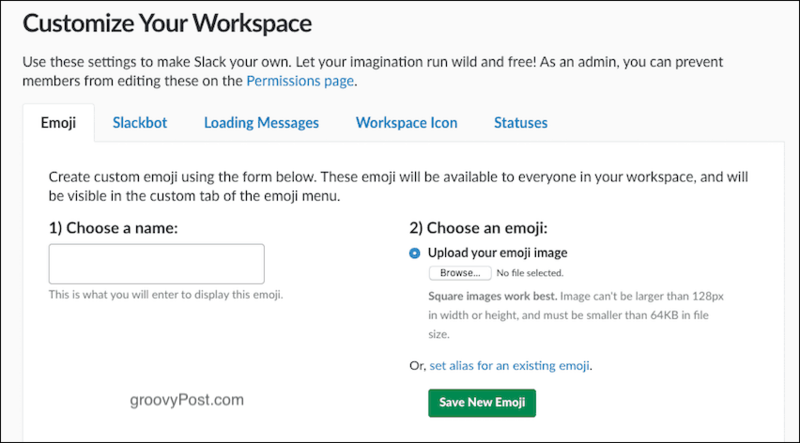 But if you have your own preferred emojis, you can upload them for use in your Slack workspace. 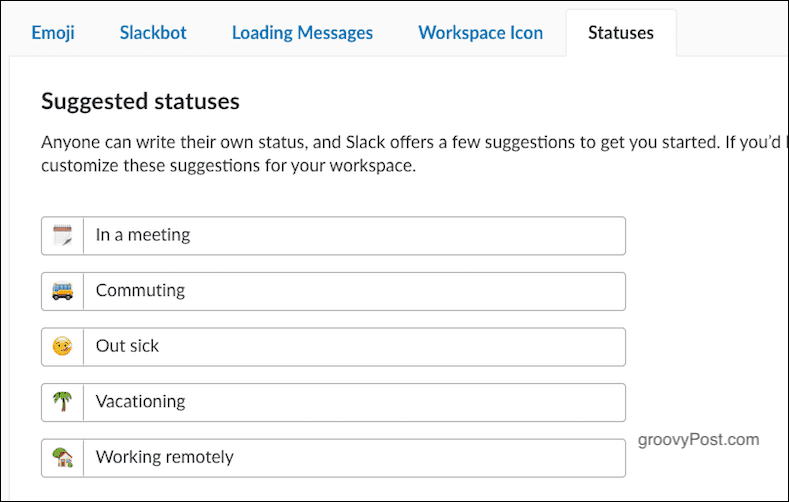 Inside your Slack workspace, you have a bot called the Slackbot. You can program it so when someone says something, the Slackbot will reply with a set automated message. So new employees, when they say hello in Slack for the first time, can be sent a HR link to employee resources for example. “Loading Messages” is just a bit of fun. When you are logging into Slack, you will see tips and inspirational messages flash up on the screen. But if you fancy writing your own, this is where you can do it. You can also disable the default Slack ones on this page. By the way, the quote below is from Roger in “American Dad“, in case you’re wondering. This is an important one. When someone logs into your workspace (especially on the Slack software), they are going to see your company icon. In the screenshot below, it has the default black icon with my initials. But I soon uploaded my icon and made it look better. Finally, what chat program would be complete without its own status messages? Write your own here, but keep them clean! 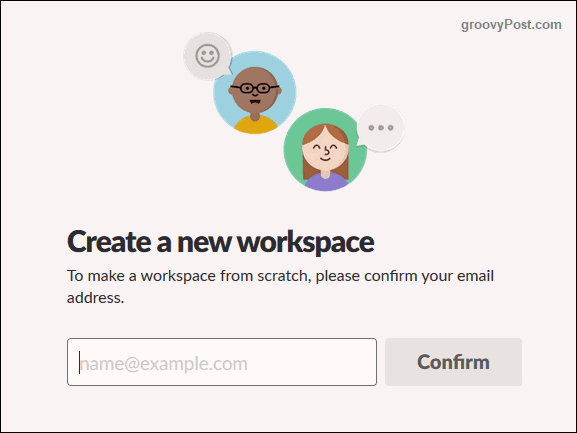 I am going to write an article for groovyPost very soon about the whole subject of Slack apps and how you can integrate third-party services into Slack. For many people, this is the ultimate in automation. On the free plan, you can only use a maximum of ten apps and some of them won’t work on the free plan. Once you upgrade to a paid plan though, all limits are removed and you can go app-crazy. So at the moment, focus on getting your Slack workspace set up and next time I will introduce you to the wonderful world of Slack apps which will blow your mind. As the whole concept of remote working takes an even firmer hold on the international workplace, apps like Slack are only going to become more and more popular. Before, you only worked in an office if it was a physical building in a street with a front door. Today that office can be Slack on your computer. It’s a brave new world, people. 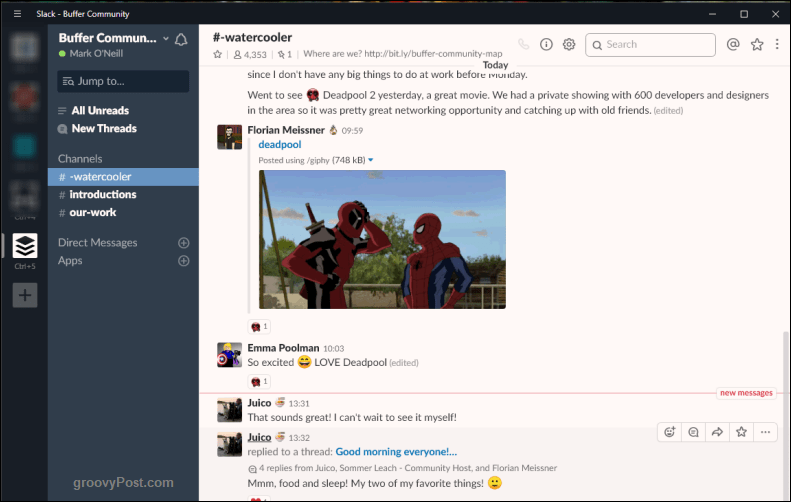 Nice to know about Slack for both creating a workspace or just plain private chatting. Thanks!